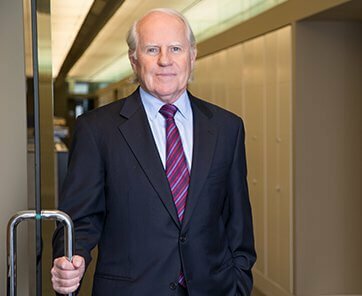 Helping someone who has been wronged is the driving force behind William B. Hanley’s success as a Newport Beach litigator. If you need a business litigation attorney, do not gamble; select one with experience and a proven track record. A prominent and respected lawyer with over 40 years of experience, Hanley is one of California’s top civil trial attorneys; his track record includes a landmark of a $50 million verdict, one of the largest punitive damage awards on record. He is also the recipient of numerous prestigious awards, including the peer-chosen Business Litigation Trial Lawyer of the Year Award. Hanley takes a no-nonsense approach to representing clients. “My motto is to communicate openly, honestly and frequently with my client regarding all important decisions impacting their case,” he says. “I want to be familiar with every unique detail so that nothing gets overlooked." 40+ years of experience. Attorney William B. Hanley has practiced law in the state of California since 1974. Since then, he has earned such accolades as being selected as the Business Litigation Trial Lawyer of the Year and earning a $50 million verdict in one of the largest punitive damage cases in the state’s legal history. William B. Hanley has been in practice since 1974 in a wide range of legal areas, including employment law, environmental law, personal injury, and trust, business, commercial, real estate, and construction litigation. The best lawyers are able to fine tune their approach as they learn more about the specifics of the case. Whether you want to settle with mediation or take your case all the way to court, I will provide experienced guidance to help your case. With many law firms, you’ll be lucky if you can actually contact the attorney. At the Law Offices of William B. Hanley, you’ll not only be able to reach me with your questions — you’ll find that I proactively reach out to you to keep you informed. If you want to take your case to court, or if the nature of your case requires it, I will not shy away from trial. I utilize many different strategies to give your case a fighting chance in court and to help you achieve the best outcome possible. Bill helped me resolve my stock resolution with my two other business partners. He made it fast, easy and quite rewarding. Great Job Bill You're the best! Professional, reliable attorney. Bill has helped our marketing business over the years and has always provided the best insight and guidance. Great attorney! !One of the best in Newport Beach. He helped me win a very large law suit against a huge corporation. I will always refer him what a great guy and a very honest person. When you are referred by other firms and attorneys you know you have the right guy. Individuals who live along California’s coast can easily utilize my services. If you’re in Newport Beach, Huntington Beach, Costa Mesa, Laguna Beach, Irvine, Santa Ana, or any of the nearby communities, contact me with your legal needs. Los Angeles is home to many entrepreneurs and small businesses. Professionals in Inglewood, Beverly Hills, Santa Monica, Downey, El Monte, Pasadena, Glendale, and the surrounding areas comprise a large part of my client base. If you’re located in San Diego, Coronado, National City, Chula Vista, Spring Valley, La Presa, or any of the other neighborhoods in southwest California, driving to my office is easy. Contact me today with questions about your case. We take into account opportunity cost and your business’ direction to make good decisions. The choice of a lawyer is an extremely important decision. It should be based on the quality of their performance as well as the results they’ve achieved. With more than 40 years of experience as a legal professional, William B. Hanley enjoys working closely with clients to resolve their legal problems. He strives to obtain favorable results for both individuals and businesses in a variety of business areas. William B. Hanley has received the highest peer review rating from Martindale-Hubbell’s peer review rating process. He has handled a wide range of cases involving punitive damage and litigation. Bill was acknowledged in 1995 by American Lawyer Magazine as an attorney whose attorneys recognize his quality service. As experienced as Bill is, he has never lost sight of what his clients value most. He has always practiced either for himself or for smaller firms, which gives him the opportunity to prepare and argue a case from start to finish. He is admitted to practice before all courts of the state of California, including all federal district courts and the U.S. Court of Appeals for the 9th Circuit. He is a member of the American Bar Association as well as the California, Los Angeles, Orange County, and federal courts bar associations. Whether you’re an individual or business looking for an attorney who will be personally available throughout your case, contact The Law Offices of William B. Hanley. He will use his experience to guide you through your case and fight for the best outcome.